In case anyone else out there is planning a Ring Road trip around Iceland, I thought it might be helpful to talk about where we caught some zzz’s along the route. We stayed in two different hotels in Reykjavik, and one night each in Hella, Höfn, Husavik, and Borgarnes. The areas worked out well, although the distance between Höfn and Husavik resulted in a long day of driving so if I had a do-over, I might put a stop in the Eastern Fjords in between. We definitely enjoyed a few of our hotels more than others, but all of them were quite lovely. I’ll point out my top three choices. The warm, rustic vibe of Hotel Ranga had us at hello when we checked in after a very chilly, rainy day outdoors. Just on the outskirts of Hella, the hotel has a middle-of-nowhere feel that we were sort of expecting in an Iceland accommodation, and it would be a perfect spot for viewing and photographing the Northern Lights if you’re there at the right time. (The night we stayed the sky was thick with cloud cover.) The location also made for a quiet night and I slept so great. Our room felt like a cozy cabin but with plenty of amenities including a large flat-screen TV, a towel-warmer rack, big fuzzy robes, and a huge Jacuzzi tub. I used my point-and-shoot for the photos and they just don’t do the room justice, nor do they illustrate the size of the giant bathroom. 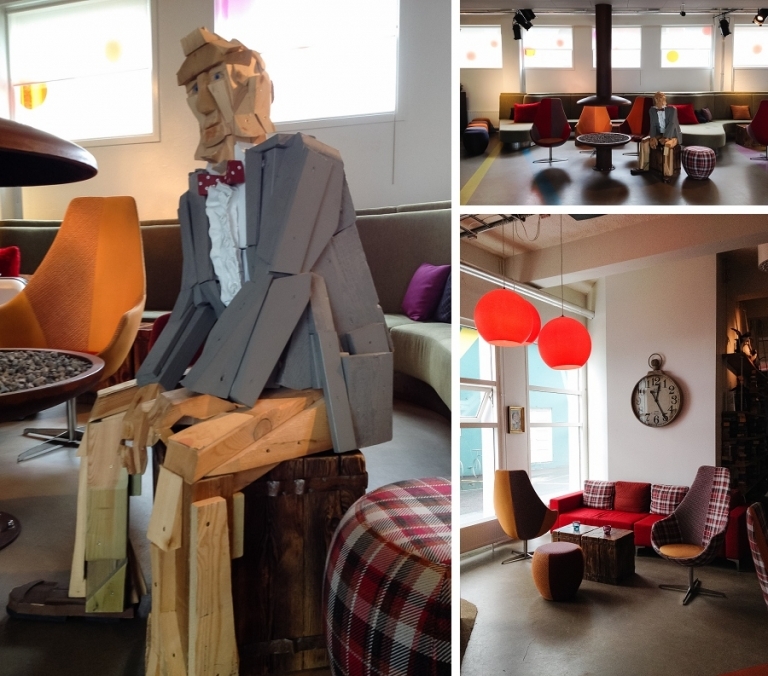 Next up, Icelandair Hotel Hamar was a nice choice in Borgarnes and wins my vote for hospitality. From the looks of the outside, it reminded me of a motel – a long, one story building (though modern designed) with entrances outside. Once we checked in though, we were charmed by the warmth of the sweet concierge at the front desk, and I was extra appreciative of their offer to put me on the Northern Lights wake-up call list. The comfy room was large by European standards and the door to our own patio meant that I had quick and easy access to run out and photograph the Aurora! 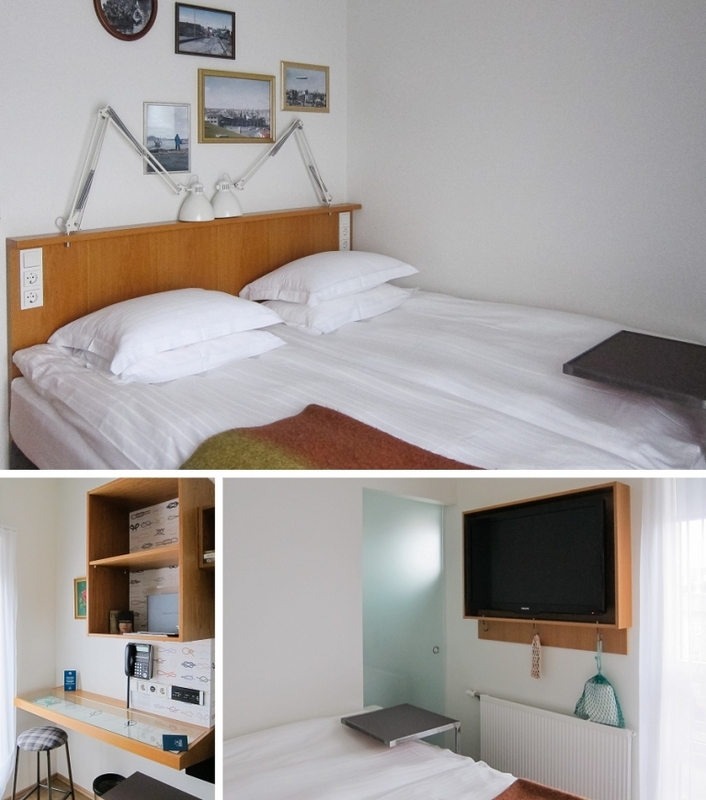 And lastly, my favorite hotel for design was the Icelandair Hotel Reykjavik Marina, hands-down. Our room was the tiniest I’ve ever seen or stayed in (if I had to guess I’d say the square footage was less than 200 ft.), but the quirky details, fun maritime decor, and humorous signage instantly won me over. A sign in our teeny bathroom even admitted to the miniscule size of the space! It made us laugh for sure. It’s also worth noting that this hotel had the most outlets out of any of the hotels including multiple outlets on each side of the bed and in-wall USB ports by the desk, and since we are some gadget-loving folk we certainly appreciated this detail! Oh, and something that all the hotels had in common was a really nice breakfast buffet spread in the morning. We really enjoyed it and got used to expecting that at each place, so I wonder if it’s just a common thing in Iceland. Let me know if you have any questions about any of these hotels – we’d definitely be happy to stay at any of them again if we’re lucky enough to return someday!